Brachiopods are small, marine invertebrates. These collectible mucrospirifer thedfordensis fossils are Devonian age (approximately 360 to 410 million years old) calcified, winged spirifer from Ontario, Canada. 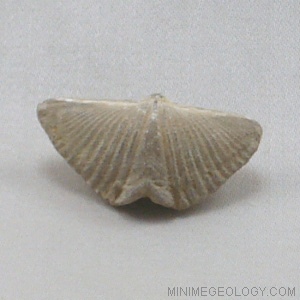 This brachiopod is sometimes called a “butterfly shell” because of its shape. Mucrospirifer lived in soft mud all over the world. An information card with details on the rock formation, mineral content, characteristics, and uses is included. Typical samples sizes are generally 0.5 to 1.0 inches in length or width but can vary based on availability and natural fossil shape.